50% of the total needs to be paid before booking will be confirmed. 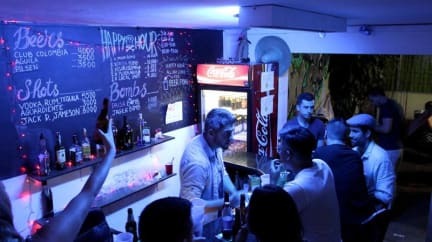 We are an Australian owned Party Hostel for the experienced partier in the authentic Medellin Area We offer Free Wifi, Privacy Curtains, Pool Table, Ping-Pong, X-box 360, Playstation 4, Salsa Lesson, Language Exchange, House Keeping, Lockers, Hammocks, Kitchen, Direct TV and of course a free welcome drink on check in. We have secure lockers to keep all your things safe. We have a smoking terrace and a non smoking terrace. Paisa City Hostel offers 24/7 Reception & Bar, free Wifi in all rooms, big shared kitchen to cook all your favourite meals in. Located just 2 short blocks from metro station Estadio. We are located in the authentic Medellin area, 2 blocks from the famous la 70 street full of cafes, bars and restaurants where you can relax over a beer with new friends you meet in our hostel, or for the confident practice your salsa skills in one of the many salsa bars on 70. We offer a wide range of tours all over and outside of Medellin. Our bi-lingual staff will be happy to assist you with any help you may need whilst visiting this beautiful city Medellin. Me gustó muchu quedando aqui. Muy divertido.